On the PGA Tour, over 200 volunteers collect statistical information from every player and every round, and the Shotlink system measures each shot by laser. The PGA Tour is then able to compare each player's performances versus the field for each round. After each season, you can also then compare each player to the tour as a whole, and you can rank each player according to how good they are in relation to each other. With Anova.Golf you can measure your own Strokes Gained, compared against a historical average of Strokes Gained baselines made up of multiple years of data. And you can break it down into 26 different categories, as compared to the PGA Tour's 6. 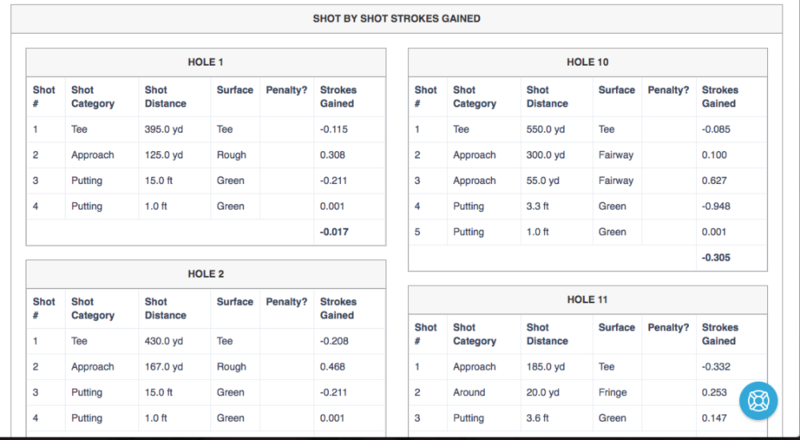 This means that you can compare yourself against an average Tour Player, and see exactly where you are gaining or losing strokes, and down to the particular distance bracket and shot type. But since we only know the information from your round and since we don't know what the rest of the field is doing, you can't compare your performance to the rest of the field's performance; we can compare your Strokes Gained in relation to one of an average tour player. And this is incredibly powerful.